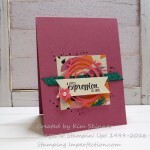 Challenge Day With Stampin’ Up! Today was a day for tackling challenges for me! My Wednesday card is always the card that I’ve created from my Paper Craft Crew Sketch Challenge. I decided to also participate in a color challenge. To be perfectly honest, I’m not sure which part of this was more challenging today! My color palette included Midnight Muse, Gumball Green, Summer Starfruit, Chocolate Chip and Crumb Cake. I know! That’s a lot of colors to stuff on one card! The sketch also required many card elements as well. So I stuffed this card full. The verdict is out…what do you think? Different to be sure! I bet you’re dying for the card details on this one! 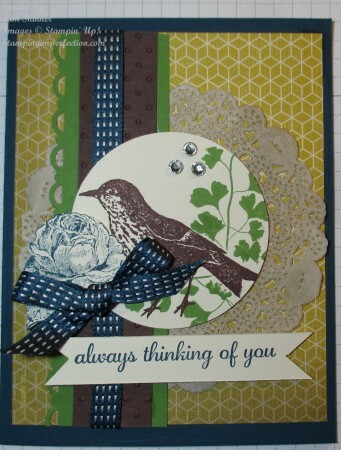 You no doubt want all of the supplies to recreate this card! 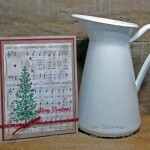 Shop online at mystampingstore.com! Accessories: Where to start…Midnight Muse satin ribbon, 2-1/2″ Circle Punch, Scallop Ribbon Border Trim, Big Shot, Perfect Polka Dots Embossing Folder, Rhinestones, Paper Doily and a brayer…what have I missed? The kitchen sink? 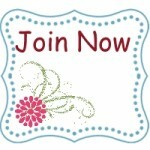 Join the Virtual Stamp Club! 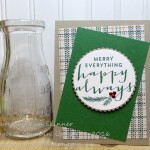 Get your stamping supplies delivered right to your door each month. 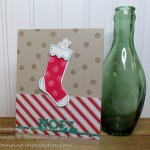 You get your stamping supplies PLUS free online video classes. Each set of classes includes at least one technique video tutorial. You also get card and 3D project tutorials. You have access to these classes forever! You can watch them, rewind and watch them again. Thank you for stopping by today!!! I think it’s a great card. Who knew those colors would look so wonderful together, I love this card! Thank you Connie! It’s one of those cards that I liked better after I walked away and came back to look at it again! !